Makes use of irregularly shaped areas: You know those spaces where no furniture can’t seem to fit in? Mounted bookshelves can fill them up nicely. Makes use of vertical space: Freestanding bookshelves are wide, but not high enough. You can make mounted bookshelves as high as you want so that no vertical space gets wasted. 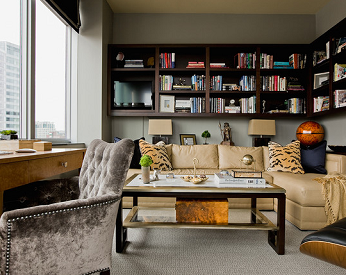 Blends in with the background: With no thick borders, mounted bookshelves don’t look bulky. They can even blend in with the walls when painted the same color. Takes up less space: Mounted bookshelves accommodate more books than those that are freestanding, but they use less space. It sounds like a paradox, but it’s true. Uses fewer materials: Sustainability should be a consideration in interior design. Mounted bookshelves don’t use up as much resources as their freestanding counterparts, making them the greener choice. Want a flawless installation without the headache? We can handle the installation for you. Contact us at Forner-La Voy Builders for more information about our services. Get the latest updates, news and building tips!